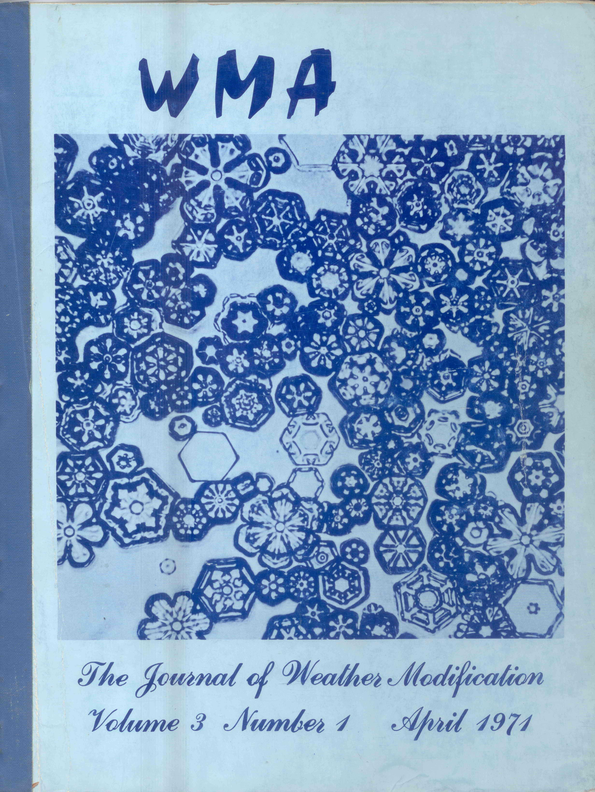 Cover images taken from the first 49 years of publication of the Journal of Weather Modification. Older covers are near the top and recent cover images near the bottom. The cover was designed by Erin Fischer. Weather Modification International field technician, Michael Paul, conducts a site visit on January 15, 2017 to inspect a ground-based cloud seeding generator used on the Wyoming Wind River Weather Modification Project. Collaborative funding for the Wind River Program provided by the Wyoming Water Development Commission, Central Arizona Water Conservation District, Six Agency Committee, and the Southern Nevada Water Authority. Photo by WMI technician Ryan Hudson. Project on 21 July 2015. Image taken by Mike Torris. Image taken from the cabin of the University of Wyoming King Air over the Medicine Bow Range during the 2012-13 AgI Seeding Cloud Impact Investigation (ASCII). Image provided by Bart Geerts. Ice accumulation on the particle probes and wing front of the University of Wyoming King Air during the AgI Seeding Cloud Impact Investigation (ASCII 2012-13) campaign over the mountains in southern Wyoming. Ground-based glaciogenic seeding was conducted as part of the Wyoming Weather Modification Pilot Project, which will be completed in 2014. Photo courtesy of Binod Pokharel. Wyoming Cloud Radar reflectivity transects across a shallow orographic cloud over the Medicine Bow Mountains, which was seeded as part of the Wyoming Weather Modification Pilot Project. All four transects, 40 km long, were flown between fixed points about 2.6 km downwind of three AgI generators. The projection of these generators on the transect is shown by star (*) symbols. The change in reflectivity after the second transect may be attributable in part to AgI seeding. The “Once in a Lifetime” photo was taken by University of North Dakota (UND) Atmospheric Sciences Chief Research Pilot Wayne Schindler on April 22, 2011 in southern Oklahoma from the UND Cessna Citation Research Aircraft. The Citation was being flown in support of the NASA-sponsored Midlatitude Continental Convective Clouds Experiment. The project site of the Southeran California Edison Upper San Joaquin Basin Program. The top photo is the Colby Meadow looking toward Evolution Valley; the bottom photo is the Pioneer Basin looking south. Photos courtesy Rick Stone, RHS Consulting Ltd.
Roger Tilbury looking for suitable clouds in Saudi Arabia - picture taken 4 August 2009 by Duncan Axisa (NCAR). Vigorous convective top capped by pileus composed of small newly nucleated cloud drops - picture taken 11 August 2009 by Mike Chapman (NCAR). University of Wyoming research aircraft photo courtesy of Prof. Vanda Grubišić, Department of Meteorology and Geophysics, University of Vienna, Vienna, Austria. SOAR research aircraft photo courtesy of Duncan Axisa, National Center for Atmospheric Research, Boulder, Colorado, USA. Cover photo of mammatus formation over Rapid City, SD, courtesy of Andrew Detwiler. Cover photo courtesy of Bruce Boe, Weather Modification Inc. The picture was taken by Ms. Erin Fischer, Data System Operator at Weather Modification Inc.
Cover photos courtesy of Darryl O’Dowd. Top left: Littlefield, Texas 1999 – distant CB tops over 45,000 ft. catch the last rays of the sunset. Top right: Littlefield, Texas 1999 – Cessna 340 with ejectable flares, C-band radar in background. Center: Calgary, Alberta 2004 – replacing burn-in-place (BIP) flares after hail operations (J. Zimmer). Bottom left: Alberta 2004 – punching through daughter cells during hail suppression runs over Calgary. Bottom right: Olds-Didsbury, Alberta 2004 – WMI’s C-band radar used in controlling three aircraft for hail suppression. In front of Yosemite Falls, courtesy of Steve Chai. The beautiful Sierra wave clouds, courtesy of Steve Chai. Cover photos are courtesy of Mr. Tom Warner, Rapid City, SD. Tom is a crew member/pilot for the T-28 research group at the Institute of Atmospheric Sciences, SDSM&T, Rapid City, SD. He is also a professional photographer; visit his website at www.warnerimages.com for more great photos. Upper - Cloud Seeding Officer Graeme Vertigan with Cloud Aerosol and Precipitation Spectrometer (CAPS) and silver iodide ice nucleus generator with burner at the end (in background), mounted on cloud seeding aircraft wing. Upper centre - The Tasmanian Cloud Seeding Crew in front of Cloud Seeding aircraft, Kevron’s Cessna Conquest (VH-LEM). Upper right - Large cumulus cloud over Rosebery, Tasmania. Bottom left - Early morning cumulonimbus cloud, Western Victoria. Bottom centre - Scientific Officer Christina Nebel inside cloud seeding aircraft with M200 data acquisition and display system. Bottom right - Reece Dam on Spill, West Coast of Tasmania, Australia. The satellite image of Australia (centre image) is a "Bureau of Meteorology image from the Japan Meteorological Agency geostationary satellite GMS-4". The image was taken on 9 January 1992. Centre image - Summary of cloud seeding operations and experiments conducted in Australia to date, experimental areas marked on satellite image. This is a reproduction of Figure 1, Map of Mendoza, Province, Argentina showing the three areas of operations: North (Mendoza and San Martin), Central (Tunuyan), South (San Rafael). See the paper by Krausset et al. this issue. Top left: P-51 cloud seeding aircraft, located in Belle Fourche, SD, 1962. Top right: Apache aircraft, used in 1965 by the Institute of Atmospheric Sciences, South Dakota School of Mines and Technology, for cloud sampling measurements of the Black Hills in the South Dakota area. Bottom left: T-6 aircraft with pilot, Charles Nelson, as part of the North Dakota Pilot Project carried out in McKenzie Co., North Dakota, 1972. 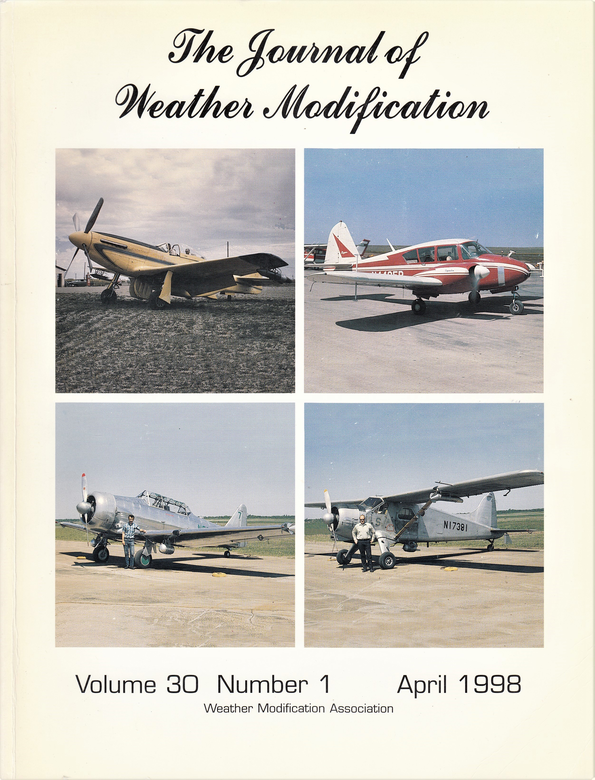 Bottom right: Beaver aircraft with pilot, Fred Anderson, used for AgI and salt seeding as part of the North Dakota Pilot Project carried out in McKenzie Co., North Dakota, 1972. From a series of 38 photographs taken during a hygroscopic flare seeding event focused on orographic cumulus over the San Joaquin River watershed in California’s southern Sierra range. (See paper in this volume.) Photos trace the dramatic change in cloud and precipitation dynamics through the hours of 1531 to 1842. Seeded cloud remains stationary while smaller cumulus clouds merge with the primary cell. This seeding event, and several other similar hygroscopic field experiments conducted by Atmospherics Incorporated over the past several years, simultaneously produced large quantities of 5-6 mm diameter graupel (snow pellets) and 3-5 mm diameter frozen droplets (hail), all reaching ground level. The latter have opaque centers surrounded by clear ice, suggesting hygroscopic seeding application may act as a catalyst for producing hailstones. Cover photo of Vincent J. Schaefer was provided by T. J. Henderson, Atmospherics Incorporated. Cover photos provided by Mr. Bruce Boe, Director, North Dakota Atmospheric Resource Board. These photos were taken in the vicinity of Bismarck, North Dakota, as part of the North Dakota Thunderstorm Project held during the summer of 1989. 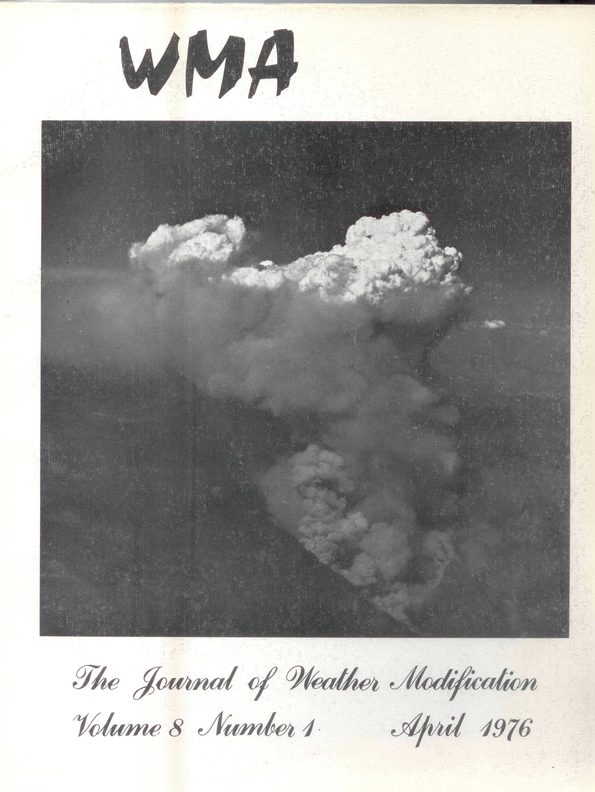 Cover photos were taken in connection with the UTAH/NOAA Atmospheric Modification Program. The field program took place in January-March 1991 on the Wasatch Plateau in central Utah. Satellite views of the Yellowstone and Uinta fires on the afternoon of 7 September 1988. Image processing by Edmond W . Holroyd, III. Cloud temperatures: white and gray > 0°C; 0°C > green > -20°C; -20°C > blue. See paper by Holroyd and Super for further details. During the meeting in France, two commemorative medallions were presented by our French colleagues to the past and present presidents of the WMA, Messrs. John W. James and R. Lynn Rose. 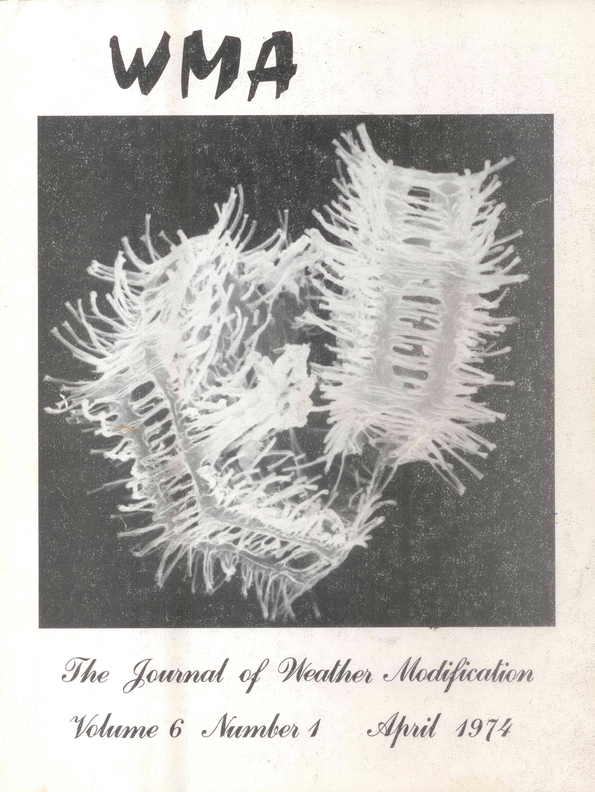 Photos of the front and backs of these medallions were chosen for the cover of this Journal issue. These medallions have been embedded in framed plastic and the set will serve as a rotating award for a special individual or group who has performed oustanding services in the area of cooperative efforts toward any aspect of international weather modification. Whenever appropriate, the framed medallions and an assocation plaque for the individual will be presented during the awards ceremony at the annual meeting of the association. 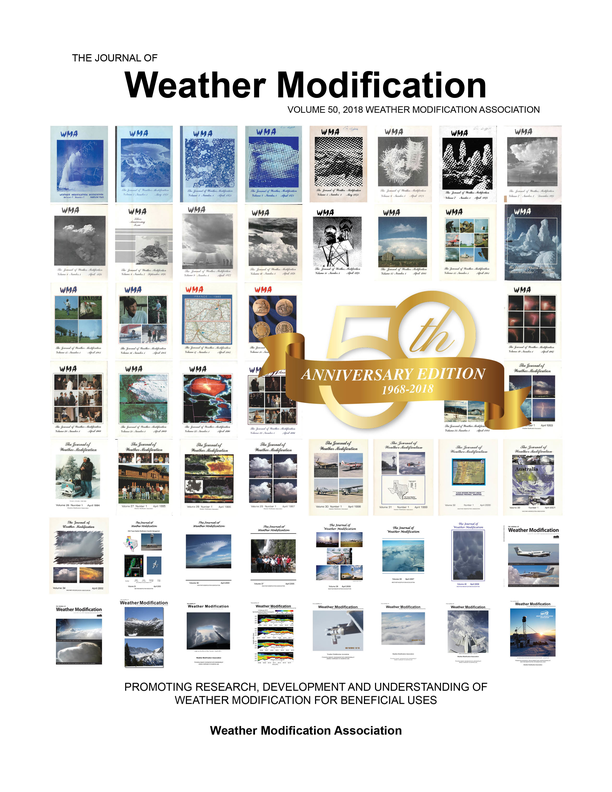 This year marks the first time in the 35 year history of the Weather Modification Association that a meeting has been organized in any county beyond the United States, Canada and Mexico. 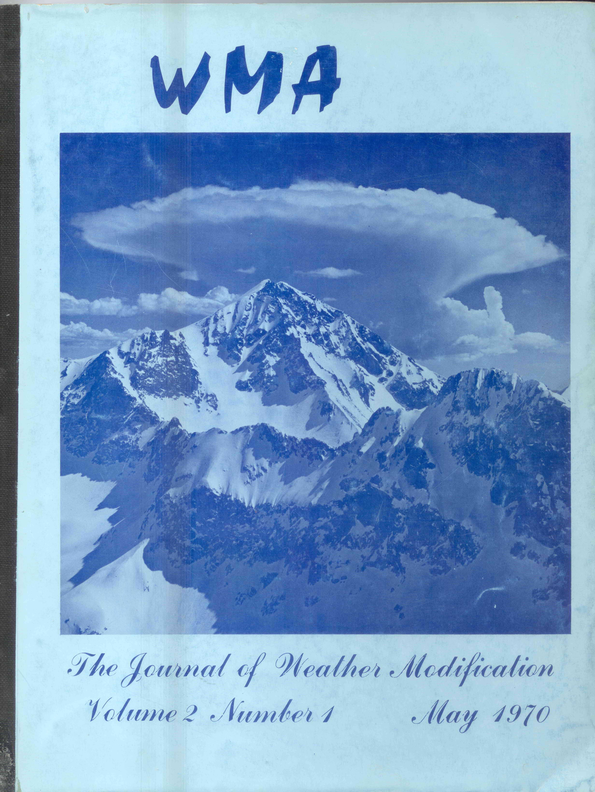 Because of its lengthy and auspicious background in cloud physics research and weather modification operations programs, France was an appropriate candidate for this "first" in WMA history. The various areas of France, and the programs conducted by French scientists, are not new to many WMA members. Examples of memorable events include the Instrumentation Conference in Lannemezan (September 1967) and the International Cloud Physics and Weather Modification Conferences in Clermont-Ferrand (August 1980). Within our scientific community these meetings have always provided the WMA members with enthusiasm and encouragement for both research and applied activities. The cover of Volume 17 was chosen in support of the WMA September meeting Clermont-Ferrand and Toulouse. These cities boast the Institutet Observatoire de Physique du Globe, Observatoire du Puy de Dome (Clermont-Ferrand) and the Association Nationale D'Etude et de Lutte Contre les Fleaux Atmospheriques (Toulouse). The maps on the Journal cover show these cities located in southern and south-central France, certainly within some of the loveliest rural areas in the world. The Association is grateful to our French colleagues for providing the opportunity. Olin H. Foehner, Jr., was lost at sea while scuba diving near St. Martin in the West Indies, May 27, 1983. 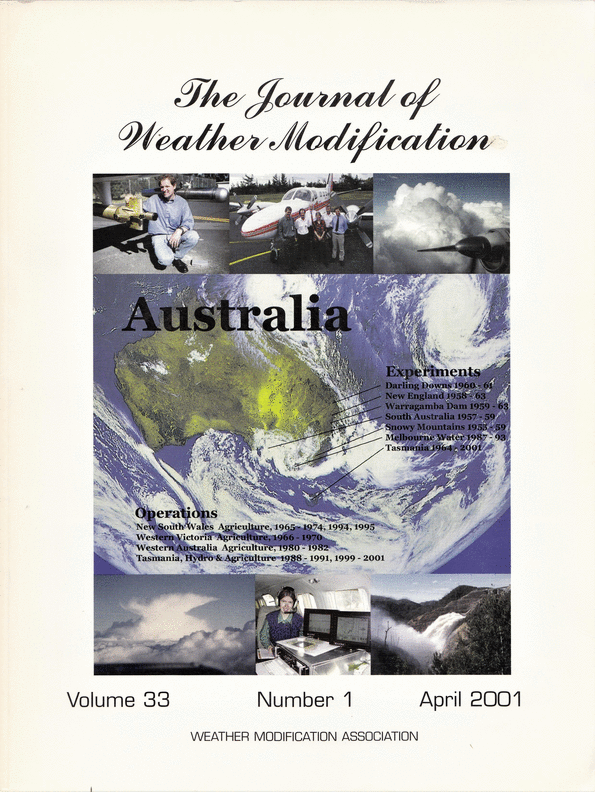 During his active and productive career, Olin was a strong proponent of weather modification operations and research programs at the international level. With the Bureau of Reclamation in the U.S., Olin served as the first Director of the Sierra Cooperative Pilot Project. He exerted a leading role in the initial planning and design of the SCPP until he was reassigned as Director of the Colorado River Enhanced Snowpack Test. While SCPP Director, the project moved from the initial planning stage to the full design phase. During the same period, the project’s field office was established at Auburn, California, the Skywater X Conference was held, the Sierra Ecology Project was initiated in cooperation with the Forest Service Pacific Southwest Forest and Range Experiment Station, and a variety of cooperative activities were initiated with the states of Nevada and California, several universities and private sector groups. Olin’s energy, his dedication to the long-term Skywater objectives, and his appreciation of new ideas contributed immensely to the programs and success of the SCPP and other Bureau of Reclamation weather modification programs under their Division of Atmspheric Resources Research. As a professional and good friend, many colleagues will miss both his expertise and good humor. The use of rockets as delivery systems for artificial ice nuclei in modern cloud modification programs has been an important part of the developing technology for more than 30 years. The use in the United States has been limited to a few small scale operational efforts in such areas as Colorado and Utah, and in one major research program, the National Hail Research Experiment in Colorado. 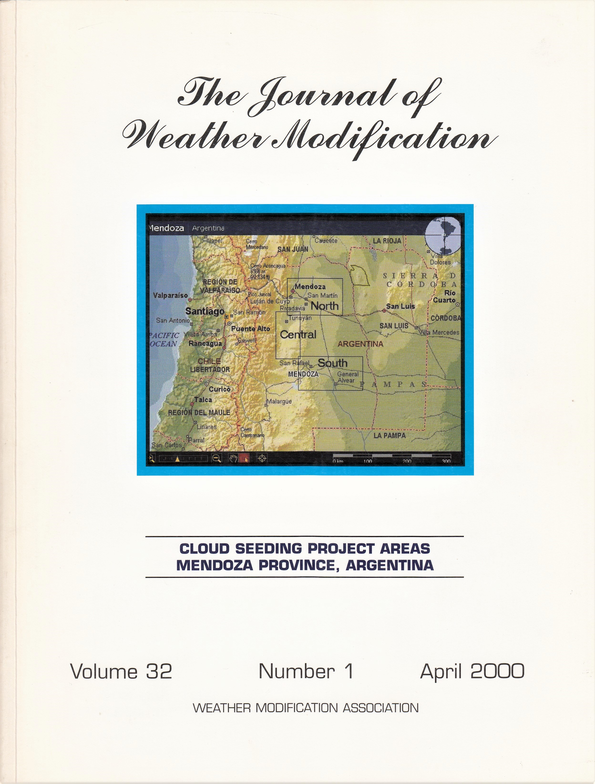 However, cloud seeding rockets have found extensive program use in countries such as Argentina, Bulgaria, China, France, Hungry, Italy, Switzerland and Yugoslavia. The most impressive rocket effort in both operation and research has been in the Soviet Union. The major research program designed to test the efficacy of Soviet rockets to suppress hail damage is Grossversuch IV. This has been a collaborative program, coordinated the Institute for Atmospheric Physics of ETH in Zurich, Switzerland, and included the participation of the universities and government agencies of France, Italy and Switzerland. The objective has been to test whether a hail suppression method similar to the one proposed by scientists in the Soviet Union can successfully be applied in Central Europe. Since 1970, Dr. Bruno Federer was the able leader of the program and through the years developed an international reputation as a dedicated and enthusiastic scientist. The cover photographs show examples of the rocket activity under Dr. Federer’s direction during the Grossversuch IV program. Photographs by Thomas J. Henderson, Atmospherics Incorporated. It is difficult to overemphasize the importance of the freezing process in our investigation of basic precipitation mechanisms. Supercooled liquid water and ice crystals, along with the infinite processes of accretion and aggregation, continue to cover our workbench with stimulating unknown. What really makes ice erystals form the vapor and liquid phases? How do these crystals actually accrete water in the presence of atmospheric moisture? How do the aggregation process produce such a fantastic array of shapes and sizes? This year’s cover illustrates some of the products which are produced by the interaction of these process. Water vapor, hoar frost, supercooled liquid water, individual ice crystals, rime ice, and snowflakes have come together on our outdoor workbench to tease our imagination in the field of chemistry, meteorology, mechanics, cloud physics, climatology, atmospheric electricity and optics, to name only a few. The scene is in Norris Basin during one of the early years of the Yellowstone Field Research Expedition. Photograph by Thomas J. Henderson, Atmospherics Incorporated. Top row: Dr. Vincent J. Schaefer making CN measurements on the north end of Hokkaido Island, Japan. Burn units on the large Meteotran lannemezan, France. Cloud seeding pyrotechnics burning on the aircraft rack. U.S.A.
Center row: Israeli cloud seeding aircraft. Tel Aviv, Israel. Bruno Federer and rocket launch on Grosversuch IV Program. Switzerland. M. T. Abshaev and large weather modification radar system. Nalchik, Soviet Union. Bottom row: Cloud seeding aircraft at end of day. U.S.A. Radar system on operation program. Vallenar, Chile. Airborne silver iodide generator. Canberra, Australia. The Sierra Cooperative Pilot Project (SCPP) is a research effort of the Bureau of Reclamation’s Office of Atmospheric Resources Management (OARM) Project Skywater - in and near the American River Watershed, California. This long-term research program is important to the enhancement of of nation’s future water supply and is part of a larger effort by the Bureau to optimize current cloud seeding technology. A portion of the SCPP involves the siting and installation of of various meteorological instrumentation, the maintenance of that network, the collection and reduction of data from the instrumentation, and the analysis of the data in support of the overall evaluation of the SCPP. The cover photograph shows one of the precipitation gauge installations within the study area. In the snow area, the gages are charged with an antifreeze solution and oil film to prevent freezing and evaporation. Bureau of Reclamation Photograph by: D. M. Westphal. Cumulus clouds form one of the most vital links between all parts of the total atmospheric engine. The various roles played by these clouds are complex but now becoming better understood. The intelligent modification of cumulus clouds will eventually produce an enormous and beneficial impact upon all people and their environment. As we increase our ability to alter large numbers of these clouds in a controlled manner, weather modification will become an increasingly important water resources management tool. Science and technology are working together to provide additional knowledge in this field. One such program is the Florida Area Cumulus Experiment, funded by the U. S. Department of Commerce. In this well designed field experiment, there is strong evidence that specific applications of sliver iodide to cumulus towers can enhance their dynamic processes and cause them to grow larger, ofter merging with nearby cloud towers and thereby process more water through the total system. 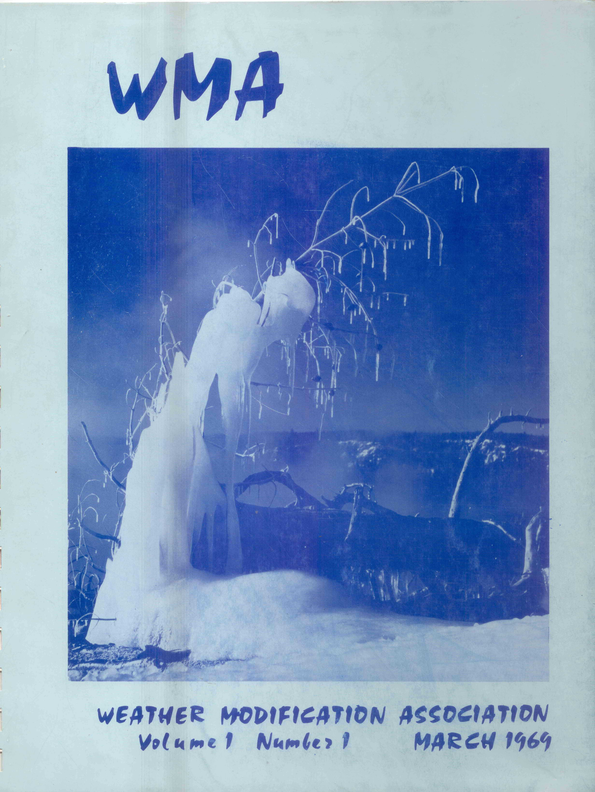 The cover photograph is an example of vertical growth caused by release of heat from the conversion of supercooled cloud liquid water to ice crystals. Photograph by Thomas J. Henderson Fresno, California. For the past 30 years, delivery systems for artificial nuclei in cloud seeding programs over the world have included such devices as balloons, kites, rockets, ground generators, parachutes and field artillery pieces. Among these delivery systems, the aircraft has probably served as the most important platform for placement of silver iodide, dry ice, organic chemicals and other nuclei types to the proper locations in and around cloud systems. A recent estimate indicates more than 100 aircraft are in use today on research and operational weather modification programs conducted throughout some 25 countries in the world. 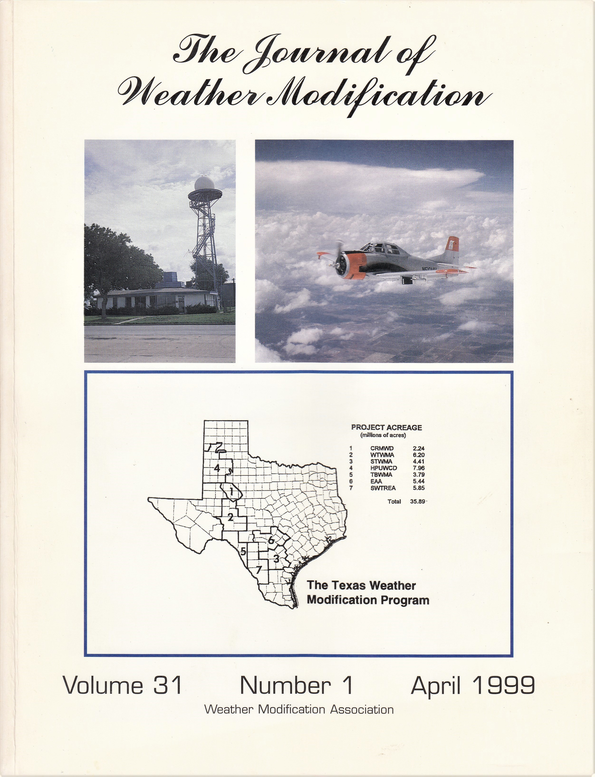 This cover shows one of these important cloud seeding aircraft on a rain augmentation/hail suppression program in Texas following the application of silver iodide to a strong thunderstorm system. Photograph by Thomas J. Henderson Fresno, California. Dr. Vincent J. Schaefer is shown doing the thing he likes best.....just being outside and trying to understand the mechanisms of simple and familiar natural phenomena. Through this wholesome curiosity and invigorating spirit, he has stimulated many people in the world toward individual action. Most important, he has taught us how to have fun while we investigate. Of his many insights, he has shown that technology is dependent upon science for all sorts of new concepts, but that science must rely on technology for the new instruments and gadgetry that allow a pioneering spirit to continue toward new and better science. Because of Vince, many of use have learned to "see" where once we only walked. Photograph by Thomas J. Henderson Fresno, California. Man changes clouds and weather inadvertently! For many centuries human beings have been unintentionally affecting their own local weather; clearing and irrigating the land, spreading concrete and asphalt, creating artificial lakes, and by just being here. The cover photograph illustrates a small scale effect from burning brush. Here a cloud begins to form atop the heat and smoke plume. In many cases the small "'artificial" cloud, developing in concert with Nature's mechanisms, may grow larger and produce rain. The example poses the question: what are "natural" clouds and do any really exist over our rural-urban-industrial earth? Photograph by Thomas J. henderson atmospherics Incorporated Fresno, California. Hail produces damage in excess of 500 million dollars per year in the United States along. Much of it comes from strorms similar to the one shown on the front cover. Clouds tops exceeding 15,000 meters with hailstone diameters larger than 5 centimeters are noted each year somewhere in the Great Plains and Canada. 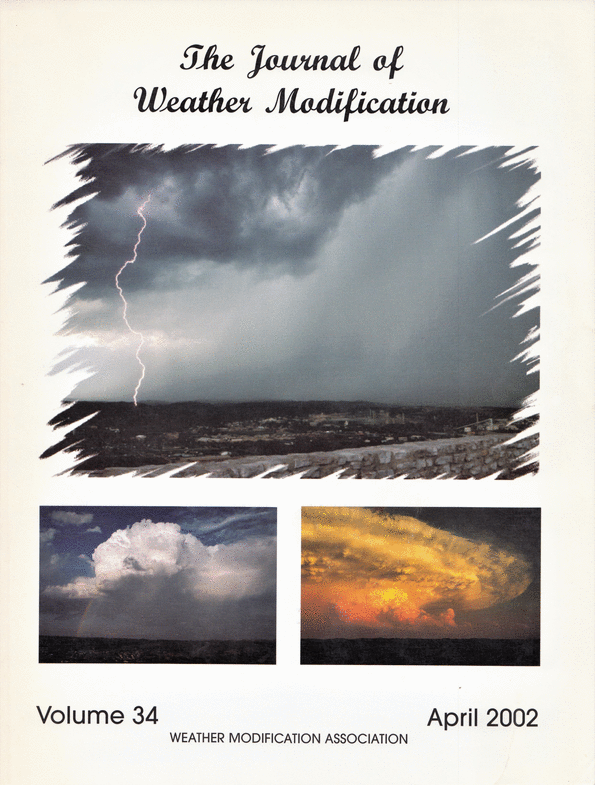 Photographs on the inside and outside covers show hailstones and hailstorms in the Colorado, Nebraska, and South Dakota areas. Photograph by Thomas J. Henderson, President Atmospherics Incorporated Fresno, Calibornia. Rime ice forms on objects in many areas of the world as a result of supercooled cloud droplets impinging and freeqing upon surfaces near the source of moisture. The geyser and warm pool areas of Yellowstone Park in winter provide an abundance of moisture for riming in an endless variety of shapes such as shown on these small trees in Norris Basin. Such an abundance of moisture during sub-zero temperatures also provides a primary requirement for a fine outdoor weather modification laboratory. Photograph by Thomas J. Henderson, President Atmospehrics Incorporated Fresno, California. Two ice crystals, replicated while airborne, show detailed "whisker" growth features. The form is similar to a small capped column with thin caps spaced 10 um apart. The whisker concentration bridges the gap between the caps. The distribution of the whiskers and the geometry determine the deposition of the whisker collected water onto the crystal surface. These rapidly grown ice crystals were replicated with methyl 2 cyanoacrylate while still airborne. The vapor replication technique incapsulates the ice crystals minimizing the migration of water to reduce the surface area and produce crystals with a smooth surface. The replica was coated with platinum and photogrphed with a scanning electron microscope. Total width of the photograph is approximately 90 um. This view looking south shows flat-topped Mt. Darwin and the headwaters of three major streams in the Sierra Nevada Mountains of California. The San Joaquin River drains away to the right. The Kings River watershed in the center beyond Darwin drains westward and Bishop Creek drains easterly out of the phot to the left. 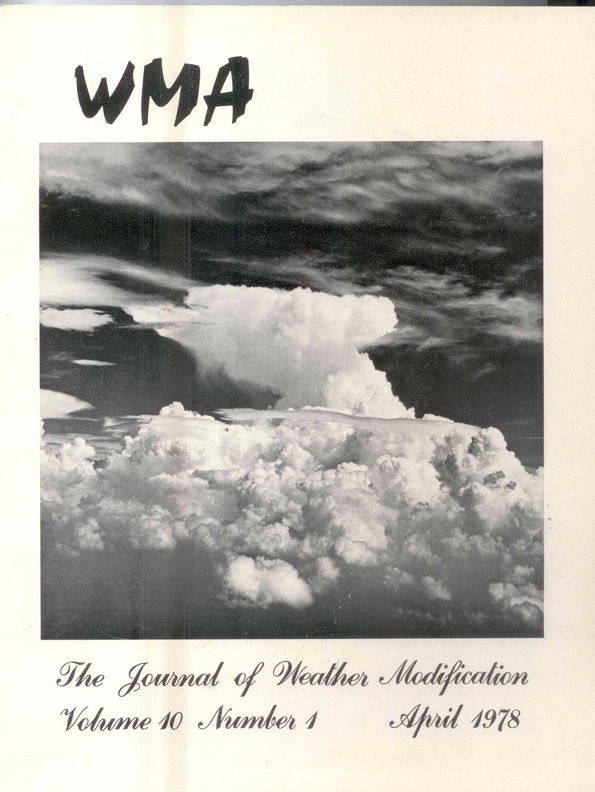 The regions have great historic significance for weather modification operations in the United States. 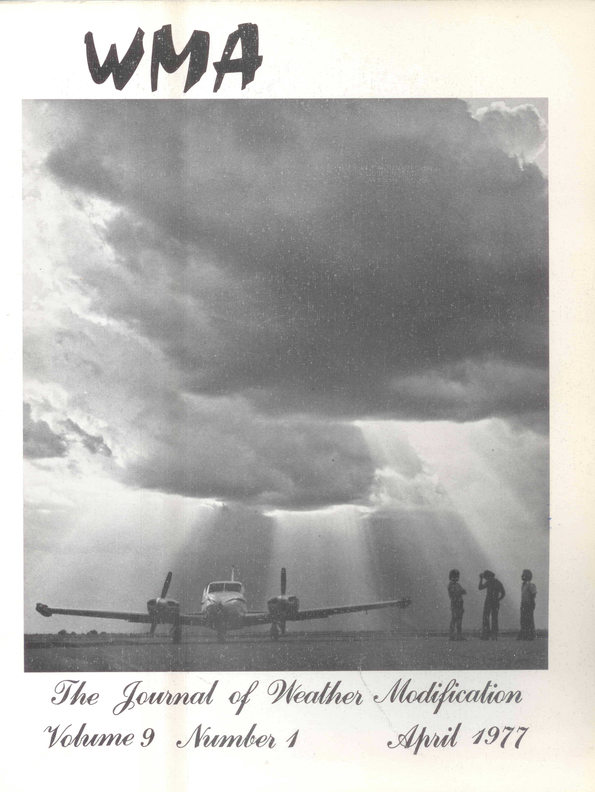 The first long term weather modification project in U.S. began over Bishop Creek with the inital seeding flight logged on 2 February 1948 under the sponsorship of the California Electric Power Company. The Southern California Edison Compaany followed with their historic project early in 1950 over the San Joaquin Watershed and the Kings River Conservation District initiated cloud seeding operations over the upper Kings River Watershed in late 1954. Both the Kings River and San Joaquin Rivver Projects have been operated continuously since their inception with the primary objective of increasing precipitation (rain and snow) for hydro power generation in the mountains and irrigation requirements in the valley. 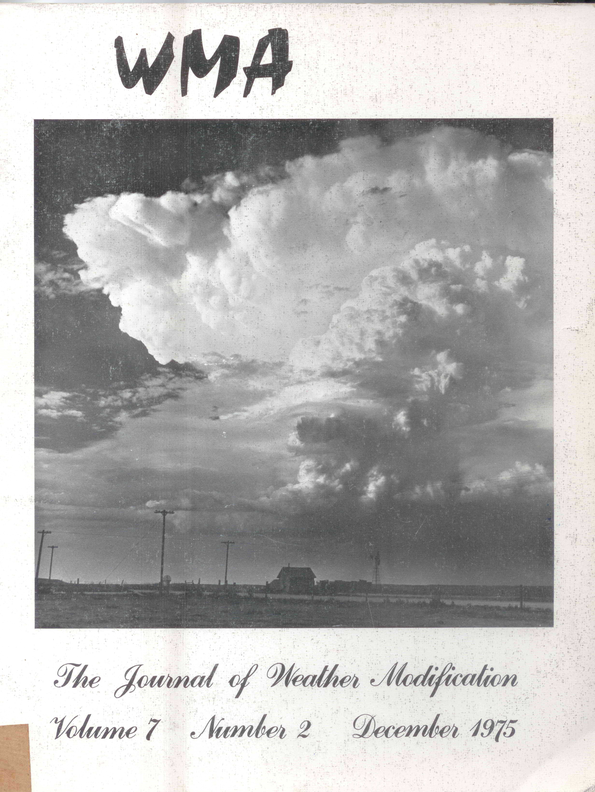 This photograph shows a "typical" hail producing cumulus development in northeast Colorado. View is looking easterly from point near New Raymer. The cell is moving away from the camera site and both hail and rain are falling from the trailing edge of the system. In-flow important to the precipitation mechanism is clearly visible immediately left of the rain and hail shaft. Photograph by Thomas J. Henderson, Atmospherics Incorporated, Fresno, California. Ice crystals produced from pyrotechnic generated silver iodide smoke into a supercooled (-2 C) cloud in a cold chamber. Crystals replicated by the Schaefer method using the formvar 15-95 in ethylene dischoride. The photograph was made with a Leitz Orthomat automatic microscope camera through a Leitz Ortholux polarizing microscope with Xenon intensity light source. Optical Magnification: 100x. Photograph by Roger Cheng, Research Associate, Atmospheric Sciences Research Center, State University of New York at Albany. Mt. Goddard in the Sierra Range of California. This peak separates the Kings and San Joaquin River Watersheds. The area is well suited for cloud physics research and weather modification operations. 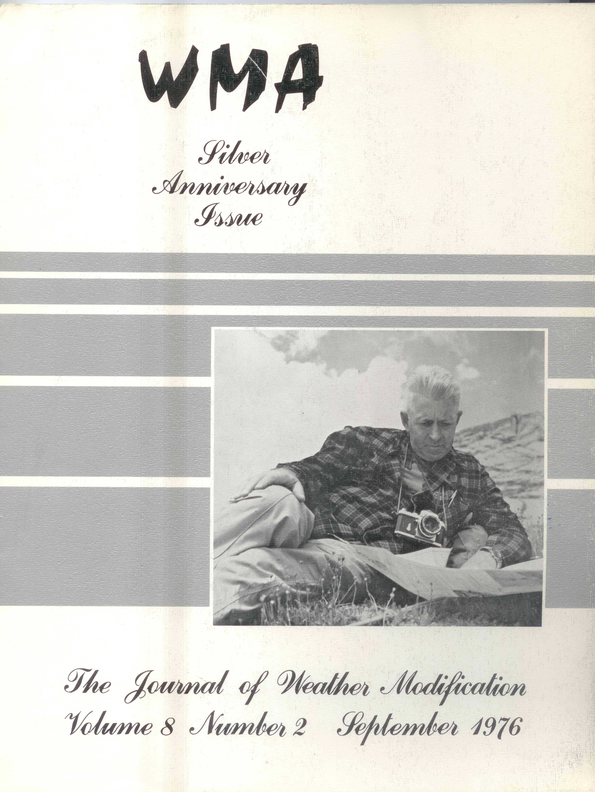 Dr. Vincent Schaefer's Yellowstone Field Research Expedition provided the setting for the cover photograph. The scene is near Seismic Geyser about two miles below Old Faithful Inn. The area offers many unique phenomena for outdoor laboratory experiments in weather modification.